Col Campbell's Shipyard: The "Small Boys"
Torpedo boat and torpedo boat destroyer development was improving as the Russo-Japanese War opened, but still was not up to what would occur some ten years later in the First World War. Even though both the Japanese and Russian navies had significant numbers of both types of vessels, they weren't as effective as they would be in ten years. 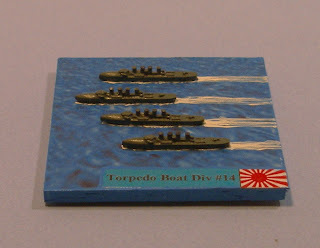 But since I have the models as part of the Tsu-shima fleet lot that I bought, I will use them. 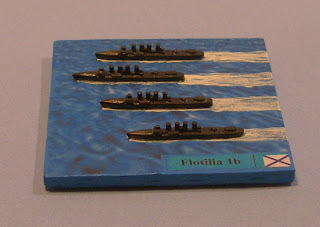 All models are from Panzerschiffe Miniatures. Please click on the pictures for a larger image. 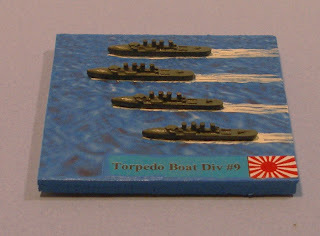 The Japanese torpedo boat destroyers and torpedo boats operated primarily in 4-boat divisions. I have enough models for four destroyer divisions (three of 4-boats and one of 3-boats), which will replicate the 1st, 2nd, 3rd, and 5th Destroyer Divisions of the main battle fleet, and two torpedo boat divisions (each of four boats), which will replicate the 9th and 14th Torpedo Boat Divisions. All of the Japanese destroyers were based on British models, either the 4-stacker or 2-stacker versions. They are pictured below. Destroyer Division 1, consisting of Shirakumo and Asashiwo (Shirakumo class) and Akatsuki and Kasumi (Akatsuki class). 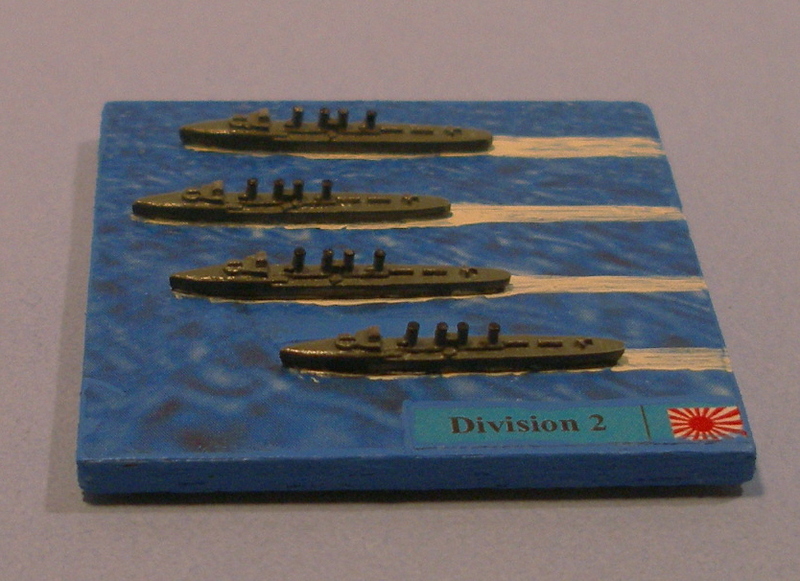 Destroyer Division 2, consisting of Ikazuchi, Oboro, Inadzuma, and Akebono (Ikazuchi class). Destroyer Division 3, consisting of Usugumo and Shinonome (Murakumo class) (2-stackers), and Sazanami (Ikazuchi class) (4-stacker). 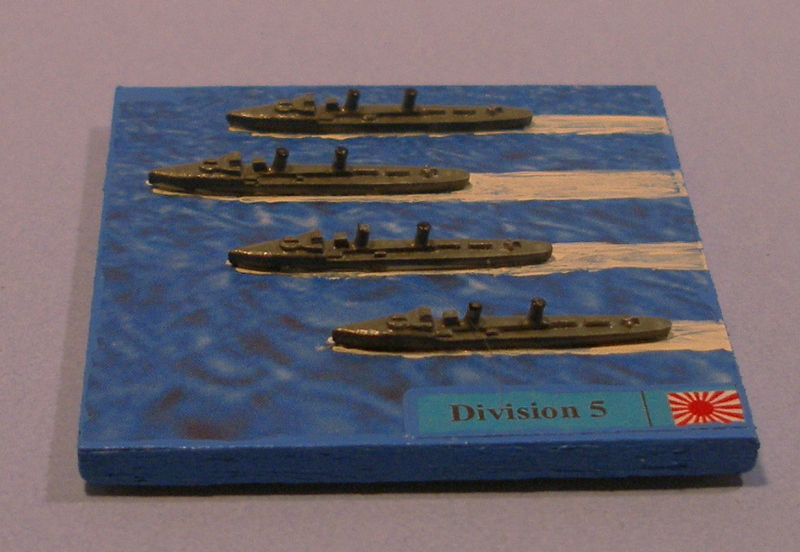 Destroyer Division 5, consisting of Murakumo, Shiranui, Yugiri, and Kagero (Murakumo class). 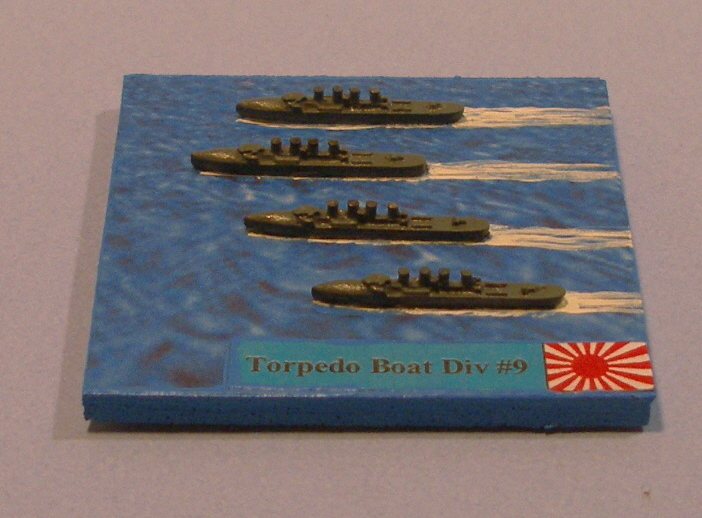 Torpedo Boat Division 9, consisting of Aotaka, Hato, Kari, and Tsubame (Aotaka class). 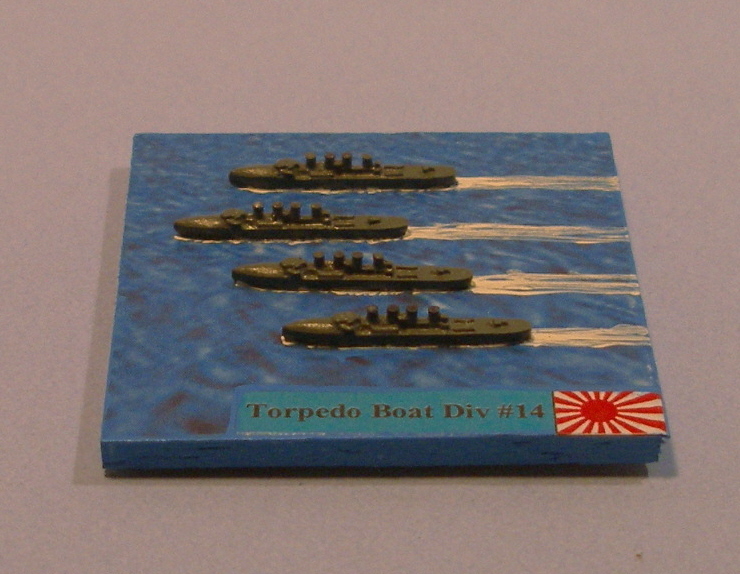 Torpedo Boat Division 14, consisting of Chidori, Hayabusa, Manadzuru, and Kasasagi (Hayabusa class). The 1st, 2nd, and 3rd Destroyer Divisions and the 14th Torpedo Boat Division were part of the 1st Battle Squadron, which included all the battleships. The 5th Destroyer and 9th Torpedo Boat Divisions were part of the 2nd Battle Division, which included only cruisers. 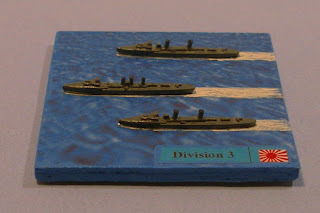 I didn't have enough models to make the 4-boat 4th Destroyer Division, part of the 2nd Battle Squadron. Maybe I'll do that one some time in the future. The Russian Navy made even more use of destroyers and torpedo boats since they followed the French operational doctrine called the Jeune Ecole which posited that smaller torpedo laden ships and boats could defeat the opposing fleet in home waters, preventing that fleet from intercepting its commerce raiding cruisers. Both Port Arthur and Vladivostok had large numbers of destroyers and torpedo boats as part of their "floating defenses." 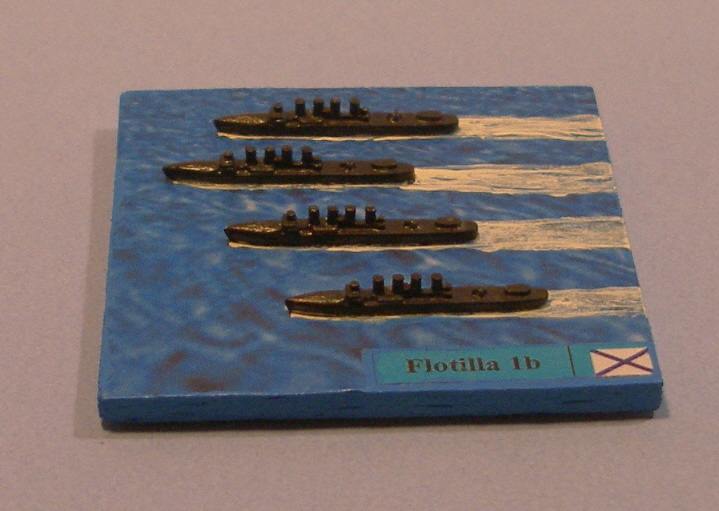 About half of the Port Arthur destroyers, however, were assigned to the battle squadron as the 1st Flotilla, represented on three separate bases. Destroyer Flotilla 1a, consisting of four Bezstrashni class. Destroyer Flotilla 1b, consisting of one Boevoi class, two Boiki class, and one Vnimatelni class. 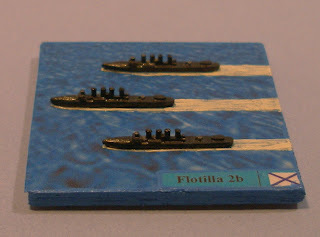 The Russian ships that were enroute to the Pacific when the war began (see Early Reinforcements) were accompanied by six destroyers, which I've organized into a second flotilla of two 3-boat bases. 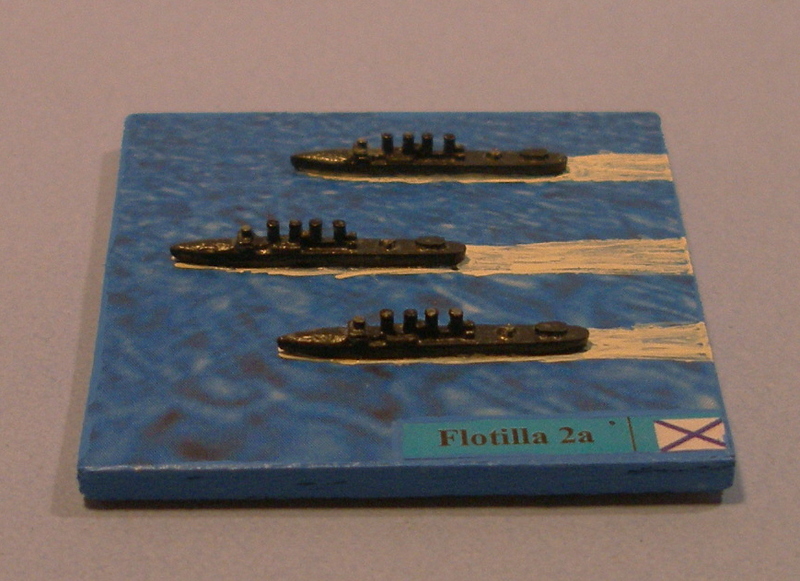 Destroyer Flotilla 2a, consisting of three Boiki class. Destroyer Flotilla 2b, consisting of three Boiki class. Some of these destroyers also accompanied the 2nd Pacific Squadron on its epic journey from the Black Sea to the Straits of Korea near Tsu-shima Island. 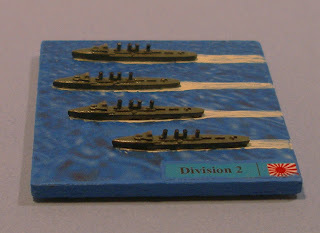 I decided in my games to use these destroyer and torpedo boat divisions as single units. They didn't have the stamina to go up against undamaged battleships and cruisers during the main battle but could (and hopefully will) be used to harry and sink the wounded "big boys" who fall out of the battle line. They will also, I'm sure, go up against each other. This completes all the ships I require for the 1904 naval battles, both the "real" ones of the Yellow Sea and Ulsan and the "imaginary" one that will pit all the available 1904 ships in a pre-cursor of the 1905 Battle of Tsu-shima. I'm currently working on fifteen additional main combatants (10 battleships and 5 cruisers) which will join the three already completed ones. 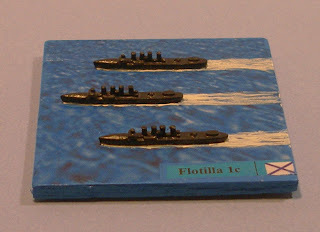 Four of the battleships will be completed tonight so their pictures should be posted tomorrow. The rest will be completed this coming week. You are going great guns, Jim. Very nice work (and very impressive too) . . . and your flotillas look great . 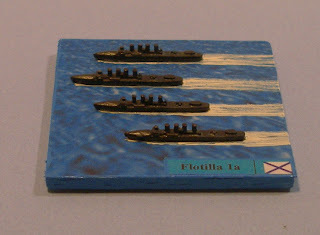 . . they are causing me to re-think my flotilla basing ideas. Wow, this project is coming on leaps and bounds, and you're putting down some serious heavy metal now - looking really good - would love to see some 'whole d*mn Fleet' photos with them all arrayed! I find the TBs / TBDs interesting in this conflict, in that the conventional wisdom has it that the Japanese were so effective, yet the Russian ones were not so - must have been a fault of their tactics, for as you rightly point out - these were still very much a developing arm for the two navies. From my reading, albeit very limited, I don't believe that either side's destroyers and torpedo boats were very effective in actual combat. What were effective was the apparent screen of destroyers that Togo threw across the Straits of Korea in the evening after the battle which caused some of the Russian ships to turn back from their course to Vladivostok. They were leery of encountering destroyers in limited visibility conditions which would put them "under the destroyers' torpedo" sights, so to speak. Unlike WW1 and WW2 destroyers which could launch three to five torpedoes at one time, the RJW boats normally only launched one (or maybe two) at a time.